(MARANA, AZ) – April 28, 2011 – The first homeowners have moved in to their spectacular Amolillo Ranch House at The Residences at The Ritz-Carlton, Dove Mountain. Twelve other homesites have also been purchased in the development in recent months reflecting the buzz about the community. Construction has begun on several homes with move-ins just around the corner. The community’s new residents are a couple from Calgary, Alberta and have nestled their 3,250-square foot winter home along the golf course to capture phenomenal mountain sunset views. The couple, who were drawn to Tucson’s laid back nature and scenic topography, will live in their new Dove Mountain home during winter months. While here, they will enjoy the many amenities of The Ritz-Carlton lifestyle and award-winning Jack Nicklaus golf course. Once complete, the initial residential phase of The Residences at The Ritz-Carlton, Dove Mountain will have 110 highly-personalized homes featuring the finest in design and finishes, together with 16 custom estate homesites. New prices for the Amolillo single family homes start at $1.1 million; Seven Saguaros single family homes start at $1.5 million; and custom fairway homesites start at $590,000; villas start in the high $600,000s; and Rockpoint Ridge custom estate home sites start at $750,000. New property owners and Golf Club members will enjoy the wide array of amenities and impeccable service all managed by The Ritz-Carlton. The community features miles of world-class hiking trails, access to The Ritz-Carlton hotel’s new 250-room resort and spa, and dedicated “members-only” access to the 27-hole Jack Nicklaus Signature Golf Course and the facilities of The Ritz-Carlton Golf Club. With views of the Jack Nicklaus Signature Golf Course set among towering Saguaros, the initial residential phase will have 110 highly-customized Ritz-Carlton Residences offering a fluid series of indoor and outdoor spaces to be enjoyed year-round. The first phase of The Residences will deliver 72 single-family homes and 38 villas, along with many golf-frontage homesites and 16 exclusive custom estate homesites. Construction of The Residences incorporates high-end residential features such as wood and stone flooring, custom closet fixtures, special wall finishes and the finest appliances, all included in the base price. More information is available at www.theresidencesdovemountain.com or by calling toll free (877) 451-7205. The Ritz-Carlton community in Marana, Arizona includes a resort, spa, and golf club featuring Jack Nicklaus Signature Golf in addition to The Residences at The Ritz-Carlton, Dove Mountain. Encompassing 750 acres within the Dove Mountain master-planned community, the new Ritz-Carlton is the ultimate in luxury vacationing as well as luxury living in the high Sonoran Desert. 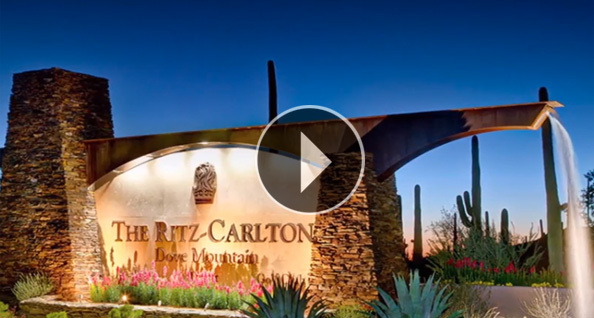 The Ritz-Carlton, Dove Mountain is designed to be a casually elegant yet sophisticated resort, featuring a 17,000 sq. ft. spa, and 250 luxury guest rooms, including 24 individual casita suites. Guests enjoy spectacular views of the Tortolita Mountains and historic petroglyphs carved into mountainsides from 300 BC to 1,400 AD by the Hohokam Indians. The Ritz-Carlton, Dove Mountain also has magnificent views of four other surrounding mountain ranges comprised of the Tucson Mountains, the Santa Catalinas, the Rincons and the Santa Ritas. A variety of luxurious meeting spaces includes three ballrooms ranging from 2,100 sq. ft. to 9,000 sq. ft., as well as five individual meeting rooms. Three restaurants, from gourmet to casual, will serve sustainable, regional and organic cuisine with Southwestern influences. The Ritz-Carlton Hotel Company, L.L.C., of Chevy Chase, Md., currently operates 72 hotels in the Americas, Europe, Asia, the Middle East, Africa, and the Caribbean. More than 30 hotel and residential projects are under development around the globe with future openings including Dubai International Financial Centre, United Arab Emirates; Dove Mountain, Tucson, Arizona; and Lake Tahoe, California. The Ritz-Carlton is the only service company to have twice earned the prestigious Malcolm Baldrige National Quality Award, which recognizes outstanding customer service. For more information, or reservations, contact a travel professional, call toll free in the U.S. (800) 241-3333, or visit the company web site at www.ritzcarlton.com. Opened in January 2009, The Ritz-Carlton Golf Club, Dove Mountain is an essential component within The Ritz-Carlton community in Marana’s high Sonoran Desert. Twenty-seven holes of golf and the 45,000 sq. ft. clubhouse complex currently comprise The Ritz-Carlton Golf Club, Dove Mountain, with an additional nine holes of golf proposed in the future. The club’s Jack Nicklaus Signature Golf emphasizes playability and aesthetic appeal while still posing a significant challenge to the world’s best golfers, who are tested by the layout during the World Golf Championships-Accenture Match Play Championships each February. For further information, call (520) 572-3500.